Ø Total efficiency achieved above 80-90%, generating efficiency achieved 40%, the heat produced could used on heat supply of buildings, heating drink water and living hot water etc. Ø The cascade utilization of distributed energy: the different utilization of all kinds of heat like high temperature, middle temperature, low temperature etc., to ensure the high efficiency. The high temperature is converted into electrical energy, medium temperature for refrigeration and heating steam, low temperature by using for heating water and dehumidification. Ø High economic efficiency: produced the same value of heat, the cost of gas is lower 30-50% than petrol and diesel; the cost of electricity is lower 40% more than electricity of power grid. Ø The CHP unit: in addition to providing electric energy, combined with other heat resources and refrigerator equipment to achieve the supply of cold, heat and electricity, which meet the needs of heating living water, steam and refrigeration. Ø Environmental impact is low: Smart Action cogeneration unit emissions of sulfur dioxide and solid waste are almost zero, carbon dioxide is reduced by more than 60%, nitrogen oxides are reduced by 80%, and the area and water consumption are reduced by more than 60%. Low noise can also be achieved through combined noise reduction measures. 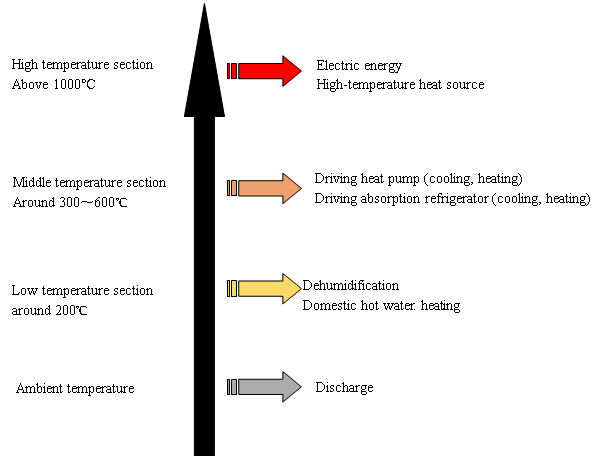 The CCHP system is an energy supply system based on gas energy, through the use of the hot water and hot gas, in order to achieve the needs of cold, heat and electricity, usually by generators, lithium bromide refrigeration device, heat exchange device, making the gas cogeneration energy is fully utilized, greatly improve the comprehensive utilization of energy efficiency. 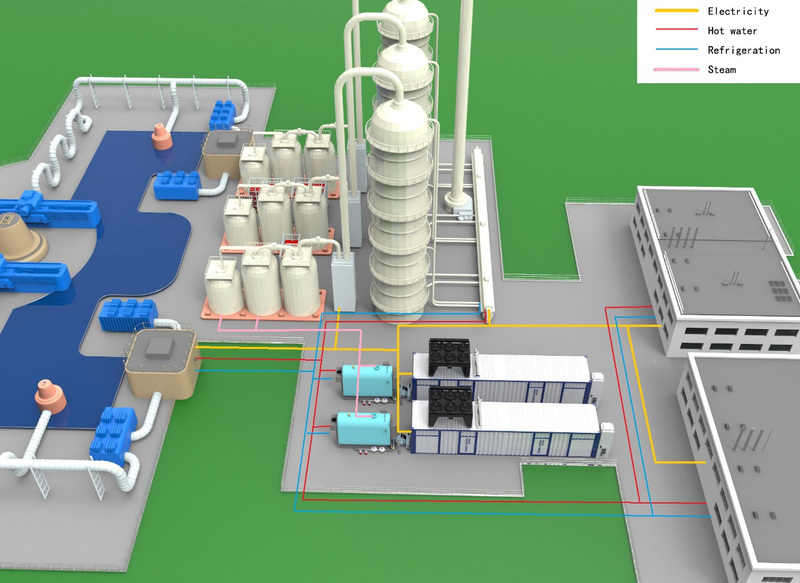 The photo is the sketch map of a chemical factory for the distributed energy application. The scheme takes energy saving, economy, low carbon and environmental protection as the starting point, adopts the technology of gas energy and improve the comprehensive utilization rate of energy. The project adopt 2MW gas generations, the total cold capacity is 6.42MW, heat capacity 3.37 MW, low temperature of waste heat can supply clean hot water 70t/d. The scheme adopts gas CHP and direct fired engine in the form of using of gas for cold, heat, electricity trigeneration. The high temperature flue gas and high temperature cylinder liner produced by the internal combustion engine enter the flue gas hot water direct fired lithium bromide unit for refrigeration steam and heating so as to meet the basic demand of cold and heat load. According to the characteristics of the load and the characteristics of the energy price, the selection of equipment and the design of the operation amount are designed to minimize the cost of operation. The system gives priority to the use of generator waste heat for cooling and heating. Only when the waste heat is fully utilized, the value of the triple supply of cold ,heat and electricity can be fully reflected, and the utilization rate of waste heat can be greatly improved. The power generation waste heat of this scheme is completely used for refrigeration and heat production.